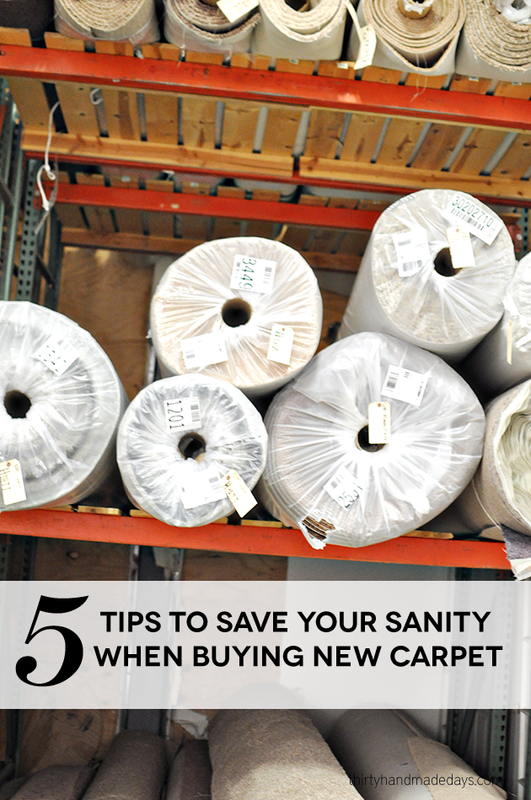 A couple weeks ago I shared 5 tips to save your sanity when buying new carpet because the process can be so intimidating. Getting new carpet isn’t like going to pick out a new lipstick. It’s a big investment and something that hopefully won’t change for years if you find the right fit for your family. I wanted to share what a big difference carpet can make in your living space with some (embarrassing) before and afters. Our bedroom is still a work in progress but with new carpet I feel like I can finally get going. I love mixing new with vintage and have tried to find a good balance that Josh will approve of. Now I’m sharing these pictures not so that you will gag (because the before is definitely gag worthy) but so that you can see what a huge difference good, quality carpet will make. And yes, a vacuumed floor definitely helps but I think the difference is staggering. The before is what kept me from inviting people to our home and especially upstairs. We had it professionally cleaned over and over but no matter what we did, the stains from 3 messy kids and a dog kept creeping back up. The after is our new super soft and extra durable Mohawk SmartStrand choice. Mohawk has a helpful tool to help you find the perfect carpet for your home as well. I can’t tell you how happy it makes me. Unfortunately we already had one spill on it. Ugh. But luckily it lived up to it’s word- we used water and it cleaned right up. The process of getting carpet installed is not fun. Even with awesome installers and great people to work with, it is a huge overhaul. Mohawk’s Dealer Locator tool gives you recommended dealers by zip code search. It makes it easy for you to have an awesome experience from choosing the right carpet all the way through the installation process. The installer said “Yeah you might as well have moved because that’s what it’s like getting ready for new carpet.” And that is dead on. I will talk more about the process of getting ready and even have a checklist for anyone wanting to get new carpet soon. But for now, trust me that it’s a lot of work. In the end, it was so worth it. I knew it would be. Looking at the stairs during the process was crazy. Everything was ripped up and it was fascinating to see the process happen. One of the things that my guy Ed at Carpet Clearance went over with me was how dramatic the stairs can be if installed by a professional. A pattern created extra work for my installers. They spent a majority of the day getting it lined up perfectly. That’s important in finding a good installer. Someone who didn’t know what they were doing could have made a complete mess of our stairs. Luckily it is so pretty. I will say that the color is different than what I envisioned. Picking out carpet is kind of like getting a can of paint. In the can it looks one way but when it goes in, it can change depending on where it’s put and how it’s put in. That’s why talking out expectations and bringing home samples (get the big ones if you can) is key. When we were picking out the carpet we wanted a pattern and a plush. It was important that they go together. They didn’t have to be “matchy matchy” but they did need to not clash. Ed guided me to two choices that complimented each other. So the plush is in all the bedrooms and the pattern is on the stairs and hallway. So what do you think? Pretty major difference right? Beautiful transformation! What are the name of the carpet colors?